Natural braided channel pattern and high dynamics of gravel-bed channel were altered by channelization project at Becva River in years 1902-1935. 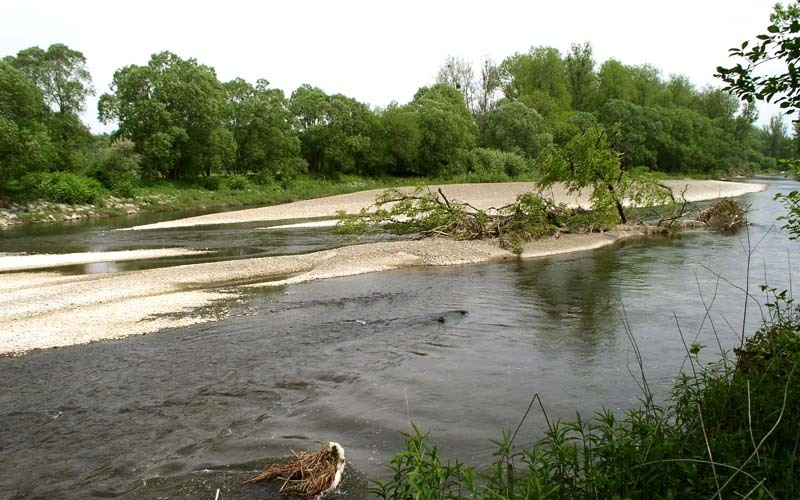 The case study site is one of five river stretches which were renaturalized by floods in 1997. In comparison with regulated channels (uniform channel width, reinforced banks) the restored section is characterized by intensive erosional a depositional processes. Wider channel and intermittent occurence of large woody debris in channel contribute to the development of hydromorphological features characteristic of braiding channel style (bars, side lateral channels/pools). Higher heterogeneity of river habitats was documented in terms of water chemistry, water temperature, substrate and aquatic biota.